THE HUM: ‘Inventing Sensations’ was a public panel discussion that looked at ways lab-based experiments within the brain sciences, are being critically explored through art, design, architecture and dance to create embodied, performed and experiential encounters. On one hand, the title ‘Inventing Sensations’ refers to a common laboratory practice: of controlling environmental stimulus to objectively map and measure a subject’s physical and cognitive reactions. Yet simultaneously, it points towards a potential future that knowledge from the brain sciences could unlock: a world of trans-realities, of environmentally or technologically enhanced emotions, sensations, and movements. Through presentations and screenings the panel proposed potential applications of brain knowledge in culture, and considered ways these may destabilise our learned habits of perception and cognition. THE HUM is a series of events produced by Amy Croft, artist-in-residence at the Interactive Architecture Lab, with support from The Leverhulme Trust. THE HUM provides moments when the background hum of Croft’s research at UCL comes to the fore, exploring internal states of being, with invited experts who have informed her ongoing work. Engineer of architecture and cognitive scientist Mihaela Mitrovic, presented her current research into the emotion of awe and the ways it is elicited by the natural or the built environment, alongside its experience in performances or works of art. Image Credit: Documentation of “Now That We Know” courtesy of Matthias Sperling. Photographer: Pari Naderi. 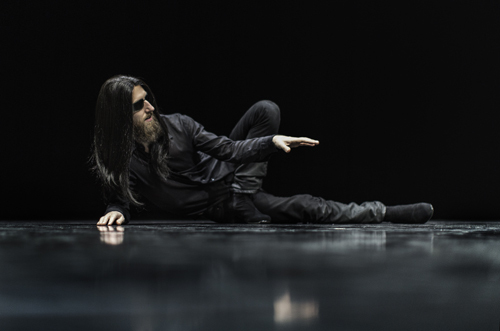 Matthias Sperling (Choreographer and Performer) discussed his performance lecture “Now That We Know” (2016) which was showcased at Sadlers Wells in September 2016 and recently performed at Nottingham Contemporary and Wellcome Collection. A science fiction work, “Now That We Know” presents a hypothetical future when science discovers precisely how our bodies give rise to our minds. Taking a choreographic perspective, Sperling freely imagines plausible, absurd, thrilling or worrying scenarios, each informed by research spanning choreography, neuroscience, social science and philosophy. Key to this work, and Matthias’ engagement with the brain sciences in his practice, has been an ongoing collaboration with cognitive neuroscientist Guido Orgs, with whom he has also made choreographic materials for the context of scientific experiments. Ava Aghakouchak (Architectural Designer) discussed her current engagement in the sciences growing understanding of how the brain binds elements of sensory input into a single experience, and her interest in situations where the relation between stimulus and sensation becomes obscure; such as in the condition of synaesthesia. Ava applies this research to the design of speculative scenarios, such as a performance involving networked sensations or in the case of her recent work ‘Sarotis’ (2016) to the ways that technologies such as wearable soft robotics and 3D-vision systems may enhance how we sense environments that are both real and virtual. 'Sarotis’ was developed in collaboration with Maria Paneta at the Interactive Architecture Lab, and highlighted by Domus as one of the best design projects of 2016. Prior to the panel discussion, THE HUM hosted a Gong Sound Bath led by gong practitioner Jarvia Foxter. This intimate gathering marked the beginning of Croft’s artist-in-residence at the Interactive Architecture Lab, with a sonic experience composed to induce a profound state of rest through a process of neural entrainment. This first HUM event was hosted in partnership with the Performance Interactions Lecture Series (PIxLS) held by the Bartlett’s new master programme: M.Arch Design for Performance & Interaction.